John Parrott MBE (born 11 May 1964 in Liverpool, England) is an English professional snooker player and television personality. 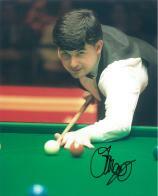 Parrott won the World Snooker Championship in 1991, defeating Jimmy White in the final. Two years earlier he had lost 3–18 to Steve Davis, the heaviest final defeat in modern times. He repeated his win over White to add the UK Championship title later that year, and is one of only five players to win both championships in the same calendar year. He spent three successive seasons at number 2 in the world rankings, and having compiled 221 centuries is one of several players to have compiled more than 200 competitive centuries during his career.